I know it’s been a while. I apologize for that. Life gets in the way, as it tends to do. I have some good stuff coming your way though. Even some giveaways! So I hope you’re all still around. So in addition to be finally sharing a fabulous dish with you today, I’m also excited that it’s been three years since our fabulous group of Kosher Connection food bloggers came together. I can’t believe it’s been three years! And in those three years, we’ve all grown. It’s amazing to see what our little foodie group can do and where we’ve been. So today, we’re having a virtual potluck meal of sorts. And I’m bringing a fabulous vegetarian side dish to the table. Summer in the kitchen, for me, is an exciting time. The food that I serve is all about what’s in season and as much as possible, what’s local. My CSA pick-up is on Tuesdays and I tend to hit up the various local farmers markets Thursdays and Sundays. I’m thankful to have some amazing options near by. 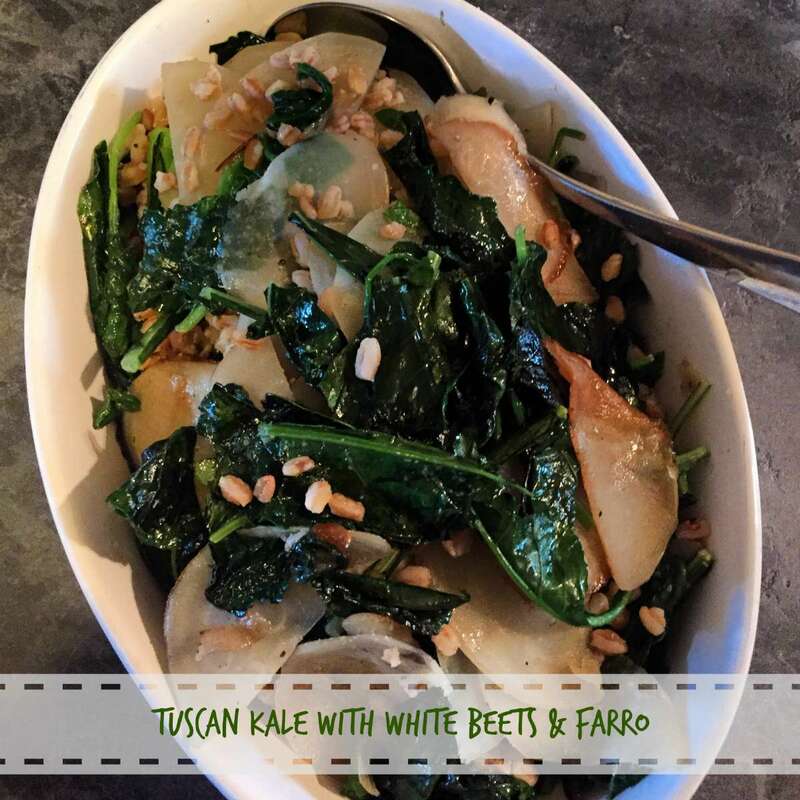 This dish I’m sharing with you and with my Kosher Connection family is inspired by some greens I had a local restaurant and something I’ve played with over the past several weeks. You can change up any aspect of this dish based on what you have on hand. The greens are interchangeable with any hearty summer green – from kale to swiss chard to spinach to collard greens – you can play with it. I used beets today, but this dish is also wonderful with Japanese Turnips, radishes and other flavorful roots. Additionally, that farro can also be swapped out. I happened to have some ready made farro in my fridge from shabbat cooking, but you can also use quinoa or barley or whatever grain you prefer. The point is to use what you have – the freshest of what you have and to enjoy it. The white beets that I used can be hard to find, but if you do see them, buy them. They are so great. If you can’t find them though, I’ve used Japanese Turnips in this dish. The taste is obviously not the same, but it’s another great root vegetable that works well against the greens. I washed and peeled the beets and then I sliced them thinly with a mandoline. I then put them in the hot pan with some olive oil, shallots and garlic. 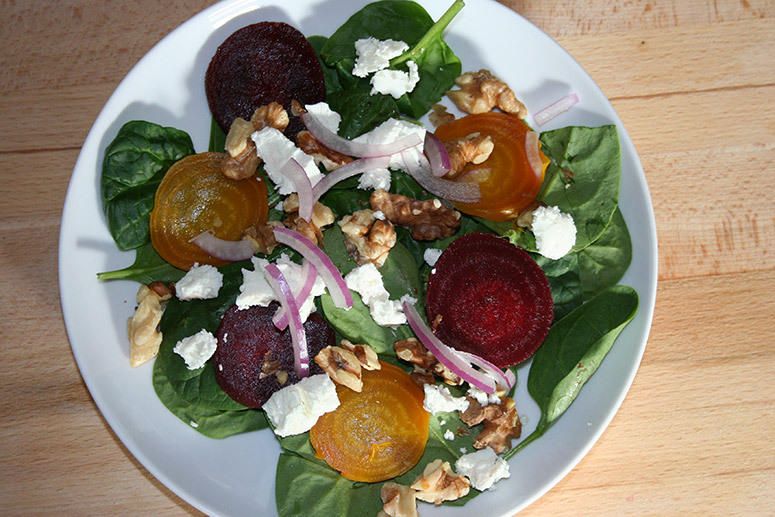 Once the beets had softened, I added in the chopped greens. I added some salt and pepper to taste and stirred everything together. Greens don’t take long to cook. Once everything was ready, I took everything off the heat and then stirred in the farro. And the dish is ready. It’s that easy. And it’s good. Hope you enjoy! Wash and peel the beets. Slice the beets thinly. A mandoline is a great tool for it. Heat up the olive oil in a large pan. Add in the chopped kale, salt and pepper. Stir and let the kale soften. Remove from heat when cooked. I’m always looking for ways to liven up the typical winter fare. I try to cook seasonally as much as possible, but I end up just craving different vegetables after a few straight days of root vegetables. What’s your solution for the winter fruit and vegetable rut? I find that a leafy and yummy salad can save the day. Changing up your and adding new and interesting ingredients can boost it to a new level. I love a good massaged kale salad. 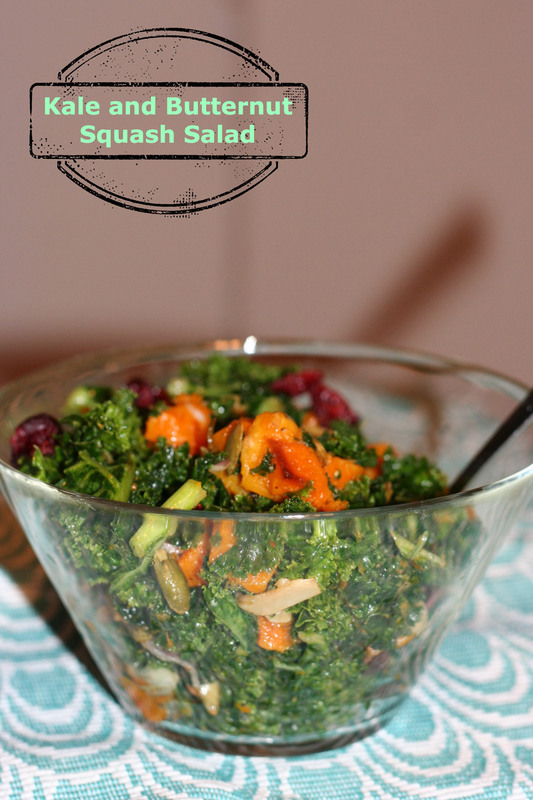 I tend to always stick to my reliable butternut squash and kale salad, but I wanted something a bit different. I had some Tuscan Kale in my fridge. Tuscan Kale has a bit of a different texture than the traditional kale. The leaves are darker and a little less curly. I decided to pair it with some radicchio and endive, which I knew needed to be used up. I was about to toss some butternut squash in the oven, yet again, when I glanced at my fruit basket. 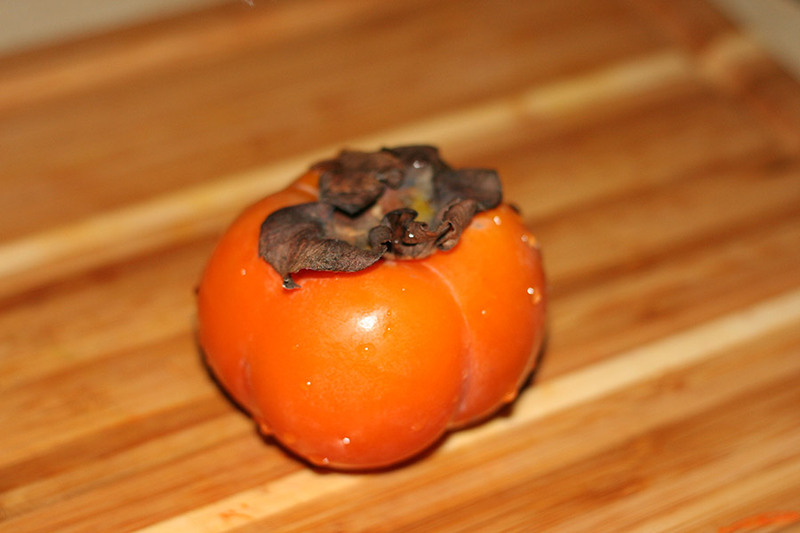 I had some beautiful, juicy persimmon waiting to be eaten. Persimmon are a fall and winter fruit. It’s one of my favorite fruits. 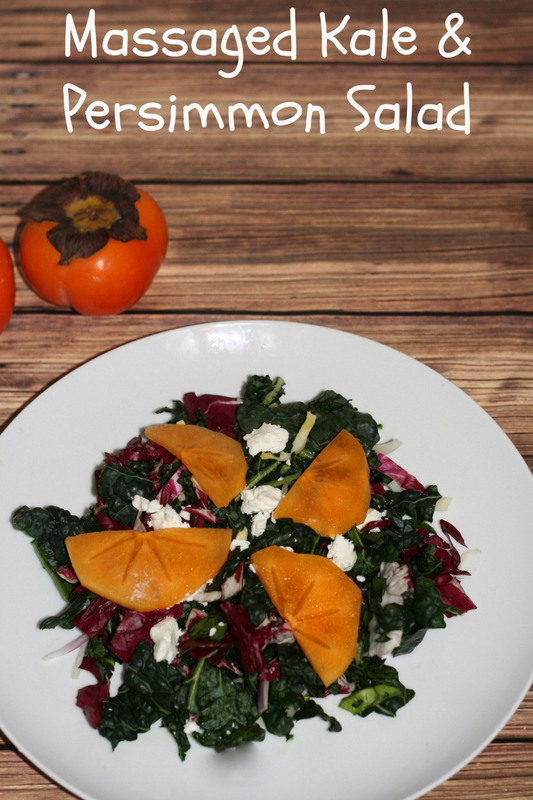 I had a hunch that the persimmon would pair well with the kale and slightly bitter radicchio. I washed, cut and trimmed the Tuscan Kale. I transferred it to a large bowl and massaged it with some light sprinkle of sea salt. I washed, peeled and sliced up some of the persimmon. The peel of the persimmon can be an irritant for some people. I mixed up the softened kale with some red onions, radicchio and endive. I topped that mixture with the persimmons and some goat cheese. 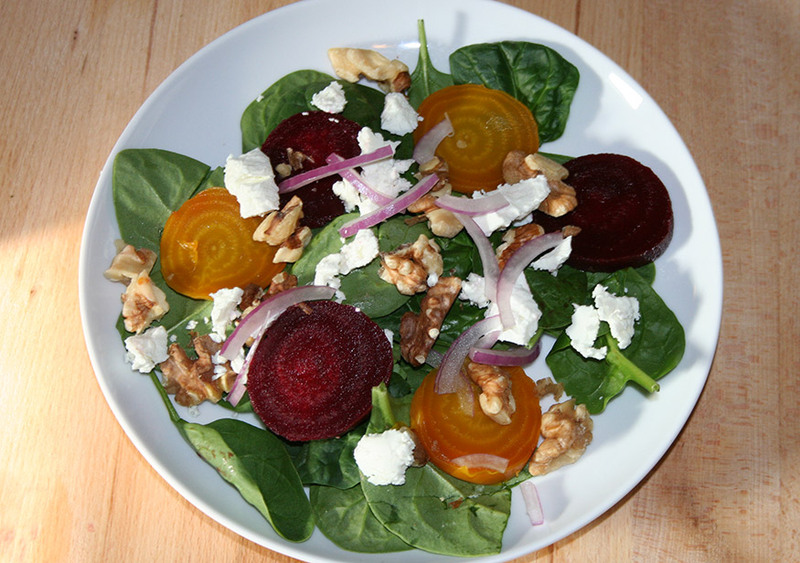 I love the way chèvre cheese adds a nice creaminess to a salad! I made a simple olive oil and lemon dressing to go with the salad. I mixed the juice of one lemon with olive oil, salt, pepper, dijon mustard and a small bit of maple syrup. The salad was delicious! I’m so glad I stepped away from the squash for the night. With your hands, massage the kale for a few minutes to break down and soften the kale. You can see how I did it here. The first time that kale showed up in my CSA, I was petrified and had no idea what to do with the abundance of curly leafy greens sitting in my kitchen. Ever since then though, I have learned to love kale and all of its applications. 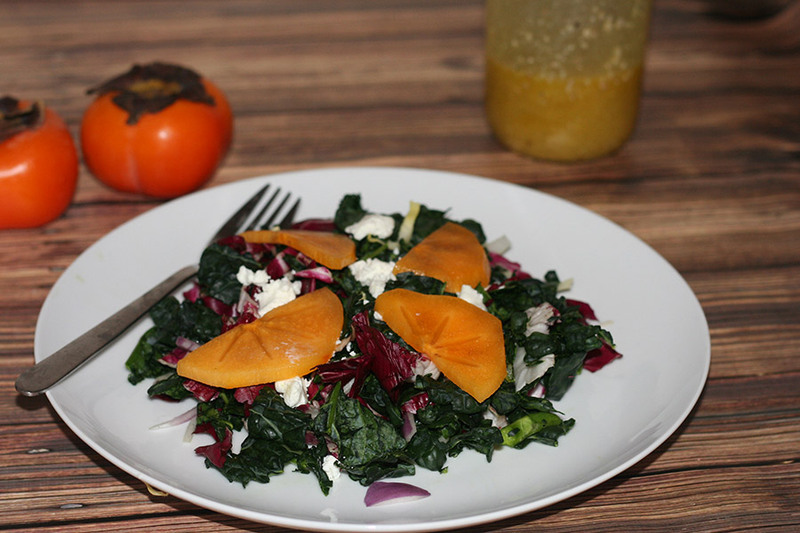 While I love kale cooked in dishes like frittata and roasted kale, it’s also great raw, in a salad. 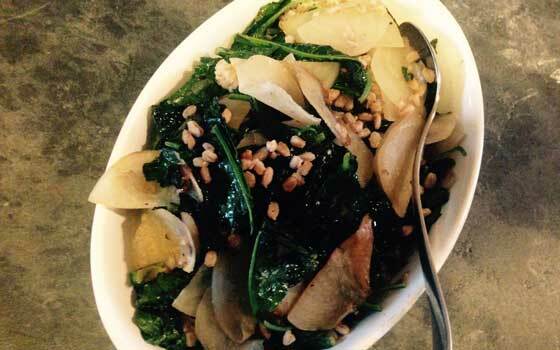 Massaged kale is a great way to eat raw kale. When you massage some kale with a bit of kosher salt, the kale begins to soften and break down pretty quickly. It only takes a few minutes to knead it to perfection. As you may already know, I love fall veggies. The abundance of greens and gourds make me so happy. I seem to be roasting up squash weekly. 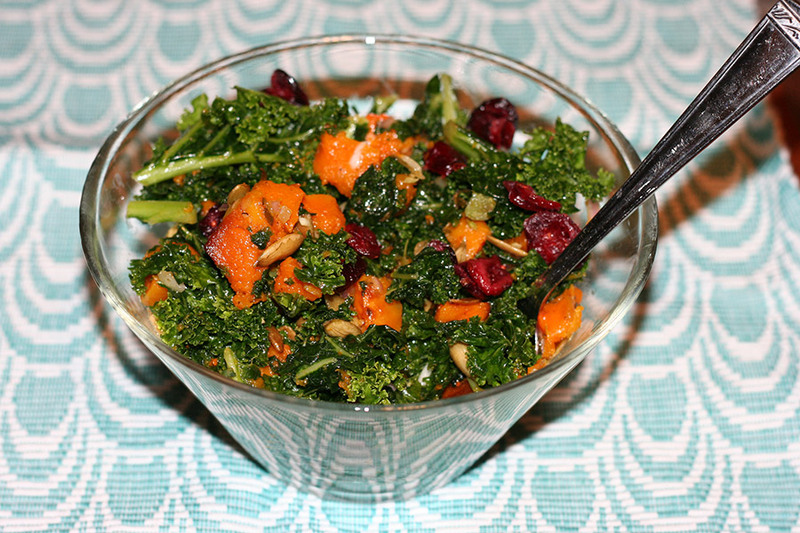 The massaged kale pairs very well with the roasted butternut squash. I thought I’d share with you this fantastic salad. I began by peeling and cubing my butternut squash. I sprinkled it with olive oil, salt, pepper, cloves of garlic and fresh herbs. I then roasted it at 400 for about 40 minutes. While the squash roasted, I washed, trimmed and cut up the kale. 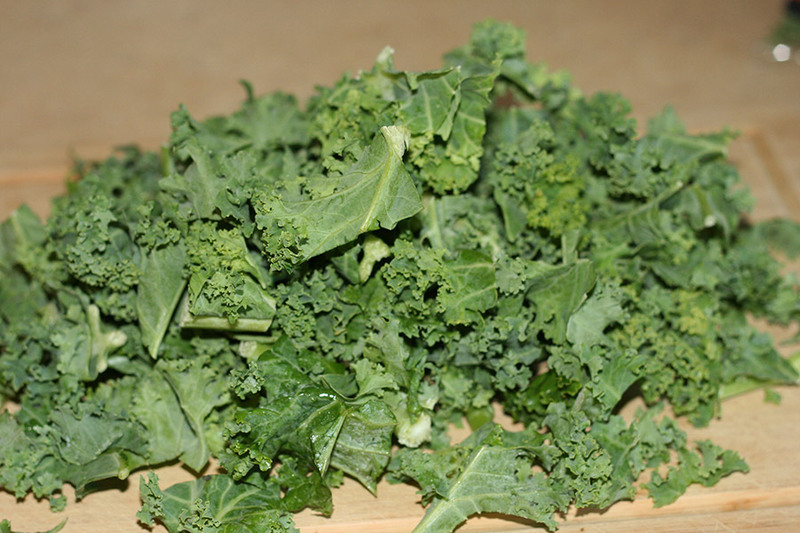 I placed the kale in a large mixing bowl and sprinkled some kosher salt over the kale. With my clean hands, I kneaded the kale well. Massaging the kale quickly brought out the water in the kale and broke it down. 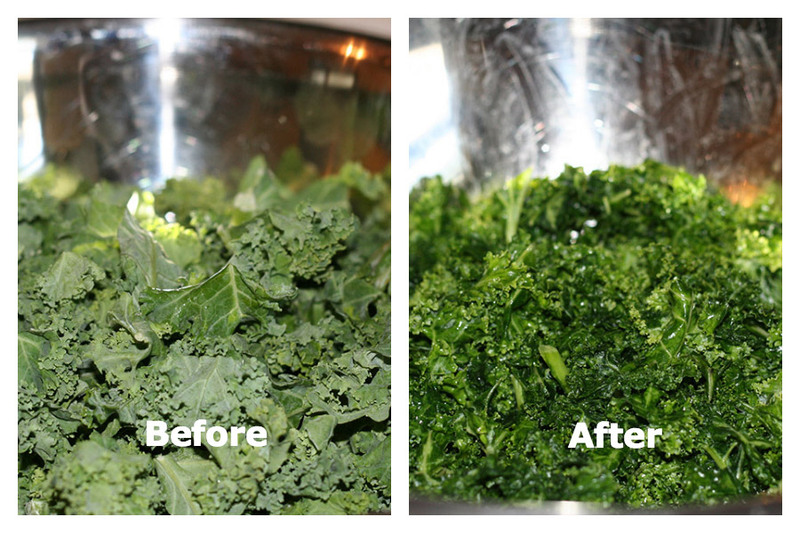 You will see in the before and after pictures of the kale how much it reduces as you massage it! I dressed the kale with some chopped shallots, pumpkin seeds, dried cranberries, ed wine vinegar, olive oil, salt, pepper and that yummy roasted squash. 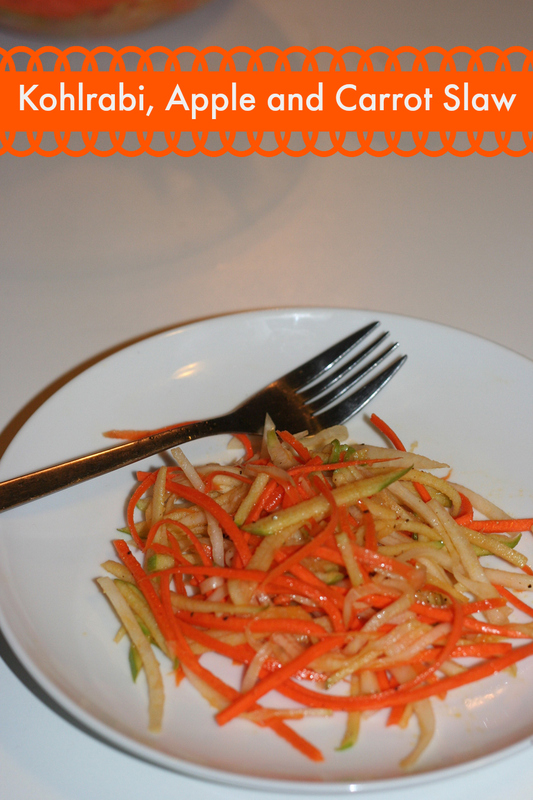 This salad is so delicious and keeps well in the fridge for a few days. Hope you enjoy! 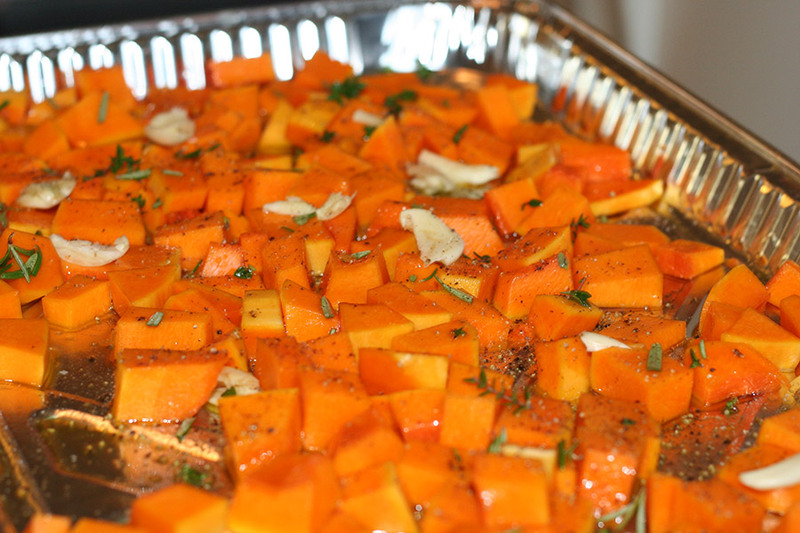 Bake in the oven for about 40 minutes, checking on the squash and flipping, every 15 minutes. Remove from the oven once it's browned, but but not overdone. Cool. Wash and trim the kale. Cut away the tough stems. Chop up the kale and place in a large mixing bowl. With you clean hands, knead the salt in to the kale. Knead for about 3-5 minutes. You will see the kale reduce and soften. The moisture will seep out of the kale. 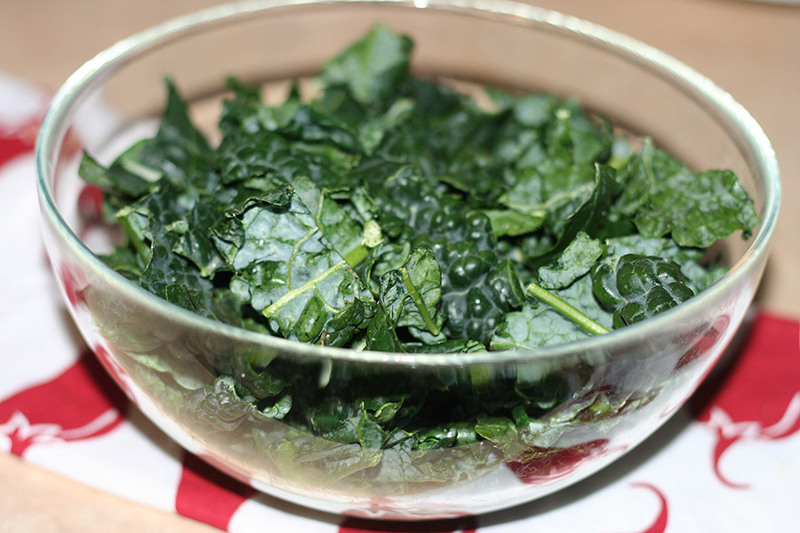 Toss the kale with the olive oil, vinegar, salt and pepper. Mix in the rest of the salad ingredients, along with the butternut squash. It’s been crazy hot here on my part of the world. I’m trying to stay away from the stove as much as possible. I’m sure you all can relate. I’ve been trying to come up with substantial dishes that can be served cool or room temperature that don’t require to much heating up of the kitchen. This especially applies to Shabbat, where I’m tasked with creating and serving multiple dishes for a crowd. This Vietnamese Rice Noodle dish is a perfect example of a meal-in-a-salad that comes together quickly and is great both warm or cold. It’s also very adaptable. You can swap out some of the veggies and change the protein to whatever you prefer. For this dish, I used turkey. I knew that my guests would be looking for some kind of meat dish and I had the turkey ready to go. I started by cooking up the rice noodles. I used the thin rice vermicelli, which I can pour boiling water over to cook. Super easy to do. After soaking for around ten minutes, I drained the noodles. I then cooked up the turkey with some garlic, ginger, shallots and chopped shiitake mushrooms. I love the flavors that comes off of the meat. Once cooked, I added some tamari and lime lime juice to the meat directly. I chopped up my veggies and made the dressing. I was ready to go. I mixed the veggies with the noodles and layered the ground turkey over it and then poured on the dressing. Everyone was happy with the salad. 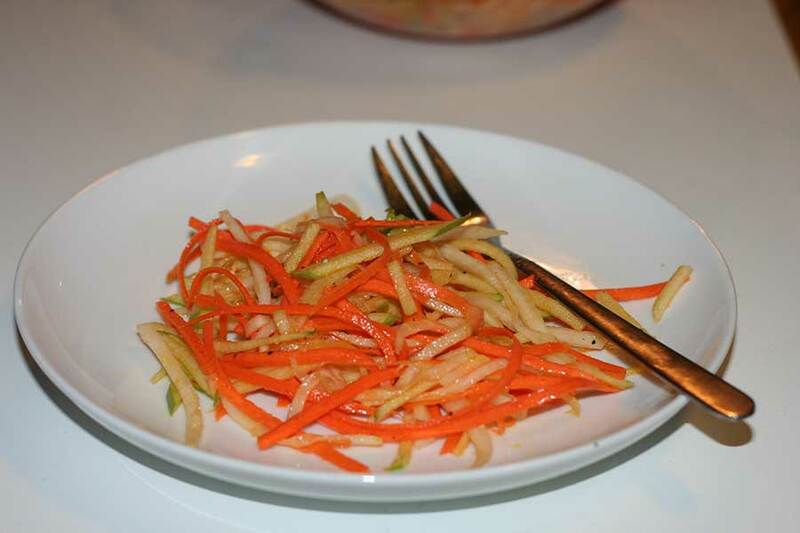 I also make a vegetarian version of this salad. When I do, I swap out the turkey and use chopped tofu or the soy beef-style crumbles. They work well. When I crumble the tofu, I tend to use an extra firm version and add some extra garlic, ginger and soy sauce for extra flavor. Cook the noodles by placing them in a large bowl and pour boiling water over it. Let sit a few minutes, drain and set aside. Heat up the oil in a large pan and saute the ginger, garlic and shallot. Add in the ground turkey and chopped shiitake mushrooms and cook until done. Squeeze the juice of a ½ lime and 2 tsp. tamari or soy sauce over the turkey and mix. Prep all of the veggies and set aside. Mix up the dressing ingredients and set aside. 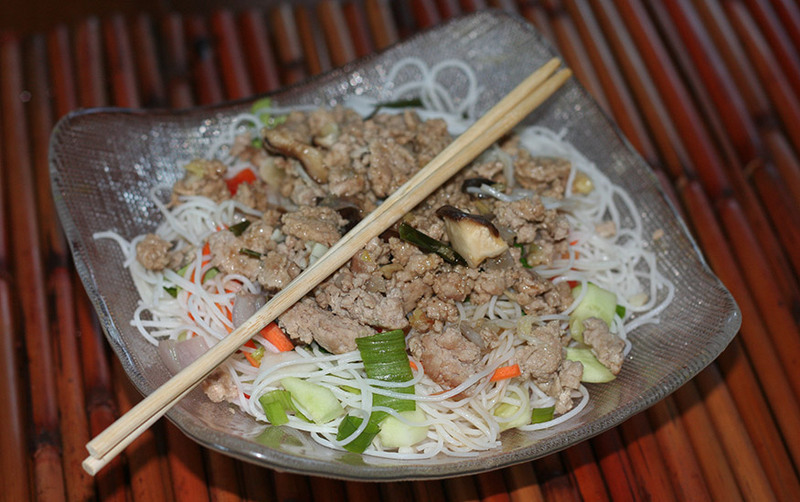 Mix the rice noodles with the veggies and then layer with the ground turkey mixture. Stir in the whisked dressing. With my bounty of amazing salad greens from my CSA, I’ve been making salads most nights for the next day’s lunch. The other night, I had run out of vinaigrette, and was trying to decide what kind of dressing to make next. I had just received a a huge amount of dill in that week’s veggie share. I was still wondering what I should do with it. It then occurred to me to use a small amount of it in to a salad dressing. I remember having a great creamy dill dressing. I wanted to recreate it in some way, but I didn’t want it to be the same gloopy dressing. I just wanted some of that flavor. 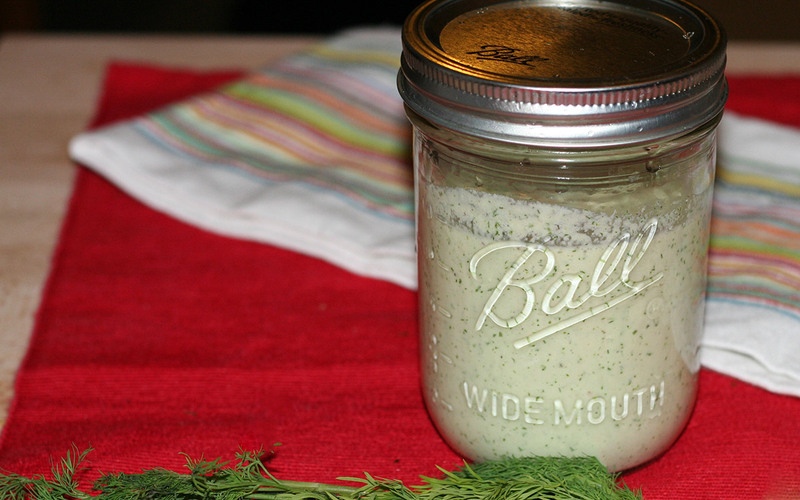 I’ve noticed that many creamy salad dressings tend to include either a sour cream or buttermilk on the dairy side. On the non-dairy side, I am always seeing mayonaisse in dressings. I didn’t want either of those things. I thought about the cashew sauce I made for pasta this winter. The cashew cream brought so much creaminess to the dish. I wondered if I could do something similar with a salad dressing. I quickly grabbed some cashews out of the freezer and began soaking. I let them soak for about an hour and prepped the other ingredients. After about an hour, I drained the cashews and placed in my Cuisinart Food Processor along with some shallots, garlic, dill, salt, pepper and water. With the machine running, I then slowly added some olive oil to the mix. 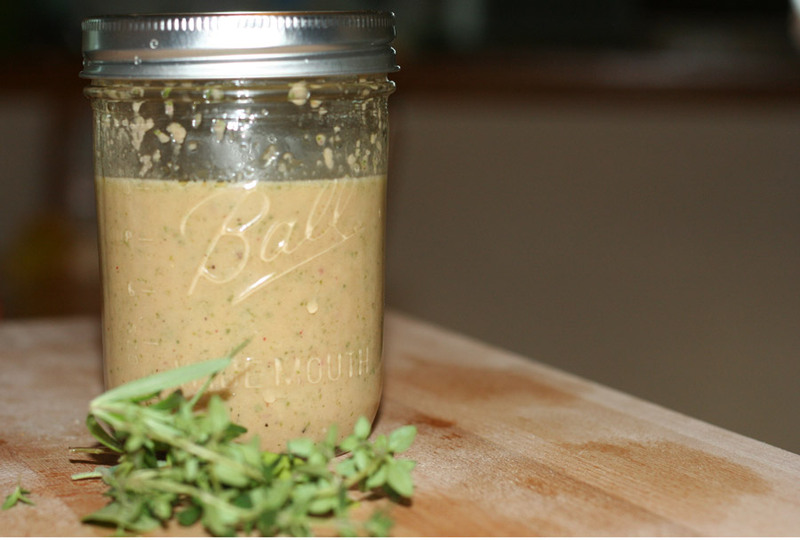 This dressing would also work well in a high-powered blender. I transferred the dressing to a jar. Of course I tried a bit before placing in the fridge to chill for the next day. Delicious! I am definitely going to use cashews more often to add creaminess to dressings! Soak the cashews in water to cover for at least an hour. Drain and rinse the cashews. Place all of the ingredients except for the olive oil in a blender or food processor. Process the dressing. Slowly add in the olive oil with the processor or blender going. Transfer the dressing to a bottle. I was so happy when I found out that Matan and Ali of AliBabka, a fellow blogger, were getting married. The Kosher Connection group of bloggers is hosting a virtual sheva brachot to celebrate with them. The Sheva Brachot are the seven blessings said at a Jewish wedding and it is customary to hold special meals for the new couple for the days following the wedding. We call these meals Sheva Brachot. For today’s meal, I decided to contribute one of my favorite salads. The caprese salad is a simple dish, but always looks elegant and is the perfect salad starter for a dairy or vegetarian meal. Remember to always use a good olive oil and balsamic vinegar and the freshest mozzarella you can find when making this dish. It truly makes a difference. Slice up your tomatoes and mozzarella in to 1/4-1/8 inch slices and wash and stem your basil leaves. Lay out the tomato, mozzarella and basil in alternating layers on a serving dish. Drizzle with about a tablespoon or two of olive oil and vinegar. Summer is beginng to show it’s signs. Warm weather and fresh summer vegetables are starting to show their faces. Yahoo! Summer produce makes me happy. On my Sunday trek to Trader Joe’s, they had the most lovely ears of corn taunting me. I usually wait until later in the summer, when the white, sweet corn comes out. I gave in to the urges. I grabbed a bunch. The whole family loves corn. The kids love the mess of eating it off the cob. I decided to roast the corn and then turn it in to a salad. Yum! Husk the corn. Make sure to remove all of the silk strands. Wrap ears of corn in foil and roast in oven for about 25 minutes. After 25 minutes, remove the corn from the foil. Use oven mitts! Hold the ear of corn over your stove flame and sear it a bit. Do this with caution. This activity is not intended for kids. Cut the corn kernels off the cob. Best to do this by holding the ear of corn straight up, while resting the bottom on the cutting board. In a bowl, mix up all of the veggies, including the freshly roasted corn. In a small bowl, whisk together the olive oil, lime juice, vinegar and spices. Mix in to the salad.